REALTOR® Place-making Grant a SUCCESS! The Northern Kentucky Association of REALTORS® and The City of Southgate held a ribbon cutting event to mark the installation of the Little Free Library® and reading bench on Tuesday October 11th This project was a part of the National Association of REALTORS® Place-making initiative. Place-making is a relevant topic to REALTORS® because as a place becomes more desirable and welcoming, properties around that place increase in value and improve the quality of life in our communities. 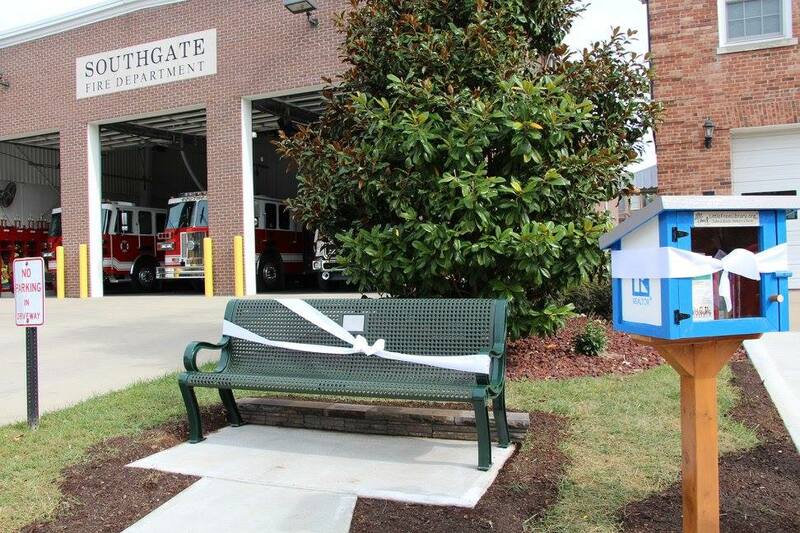 The City of Southgate and their citizens were both very excited about the Little Free Library® and reading bench as it made an existing public gathering place more robust by adding seating and the little free library which promotes literacy and community sharing. "Southgate has always been a very walkable community, and this project will just enhance that even more," Mayor Hamberg said. "I believe we are one of the few cities in Northern Kentucky that didn't have a park bench outside its city building, so we are very appreciative of this commitment to our community by The Northern Kentucky Association of REALTORS®. "And the Little Free Library® will be great for kids walking to and from school and for our residents to pick up and drop off books," he said.The back of the Little Free Library® reads USE A REALTOR® while the side panels sport the REALTOR® logo, we did this to promote the REALTOR® brand and to encourage the public to utilize a REALTOR® in their home buying & selling processes. The project also served as an excellent opportunity for REALTOR® members to engage with and strengthen the communities they do business in. "We are honored to participate in this tremendous project along with the National Association of REALTORS® and The City of Southgate," said Northern Kentucky Association of REALTORS® president Jim Simpson. "The bench and library will enhance literacy, walk-ability and place-making, which improves communities by transforming public spaces into vibrant community places." We encourage all our members to get involved in their communities and in future community outreach projects.